The Italian artist Marco Grassi aka Pho translates his background as a graffiti bomber to his vast abstract paintings by referring to progressive graffiti writing’s traditional elements: the word, the rhythm of the line and a performing dynamism. His work is also influenced by Professor Luciano Fabro, whose class he attended at the Brera‘s Academy of Fine Arts in Milan. In the style of the Arte Povera, Grassi’s works reflect the materiality of urban environment. 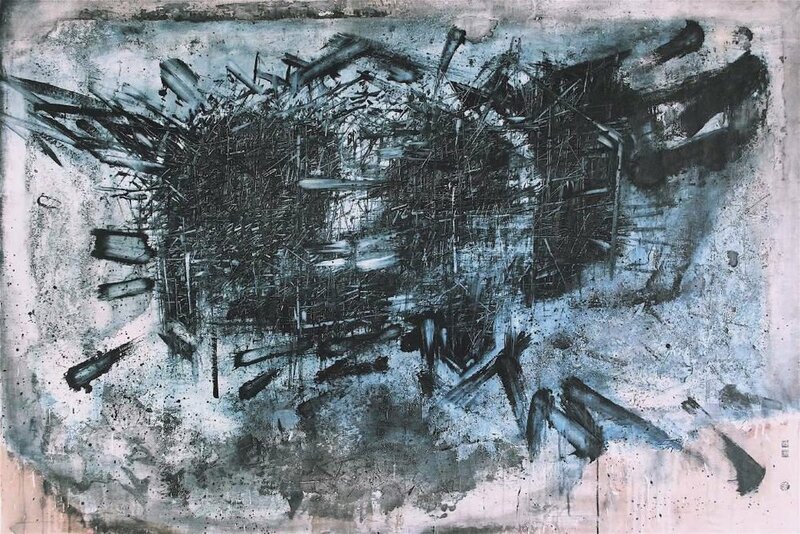 On behalf of the series "Walls", Grassi utilzes found objects such as old wooden pallets, eathered posters, rusted metal and bitumen as a subsurface for his strong and expressive abstract paintings. The artist started to produce the series in 2012 which later became a manifesto, revealing the essence of his work and the dialogue between the used materials and media. Thereby, a strong relation in the pictorial gesture and the use of different materials are the main characteristics of his artwork. The varying bodies of work are based on various conceptual, formal and technical approaches by always keeping a coherent aesthetic. As part of his project “Le Grand Verre” (2013), Grassi has produced “Rayographies” in collaboration with the artist Matteo Bologna. Therefore, Grassi has adapted ancient techniques of photo mechanics to envision the correlation between matter and light. Grassi (*1976) lives and works in Milan.